These Swedish food dishes are recommended to allow full potential when researching, restoring, repairing, tuning, or racing any Husqvarna motorcycle. Each of these foods have been thoroughly tested and found to give maximum consumption pleasure which in turn has lead, in most cases, to worldchampionship results when used in conjunction with Husqvarna motorcycles. Please use caution when using these foods without the correct motorcycles. These foods may be consumed by persons over 21 years of age, but only with strict supervision. Each of the foods listed here has been responsible for multiple worldchampionship using Husqvarna motorcycles. Torsten Hallman, Bengt Åberg, Håkan Carlqvist, Arne Kring, Åke Jonsson, Bill Nilsson, Uno Palm, Torlief Hansen, Christer Hammargren, Sven Åke Engström, Magnus Gustafsson and others have admitted in later years that the secret to thier success could be attributed to these Swedish foods and Husqvarna motorcycles! It is that simple! Mash the potatoes. Put it on a breadboard and make a small pit in the middle. Put eggs, flour and salt in the pit and work the potato-dough fast together. Too much kneading makes the potato tough. Chop finely the onion, cut the bacon into small pieces and fry it until it gets coloured. Flavour it with white pepper. Form the potato-dough to a thick roll. Cut it in thick slices and put a pile of bacon mix in a pit in the slice. Put another slice on top of it, press the edges together and roll it to a ball. Lower the balls in boiling salted water and boil them approx. 10-12 minutes or until they float to the surface. Pick them up with a perforated ladle and put them on a hot serving plate. Don’t boil too many at a time, they will then have some difficulty to float to the surface. Serve hot with melted butter and red whortleberry jam or cranberry jam. Enjoyed your food dishes. I am 75 years old and going strong. Some of this success has come from good Swedish cooking. As to Kroppkaker, we use pork at times, but really like ground beef with onion , salt and ground pepper.What really makes it good is that we add an operation.We take the dough balls,cut them in two,fry them in butter and milk. For great cooking. Another variation that my In-laws use... for the meat filling they use a combination of bacon, ham & cotto salami. The first meal we slice them in half and smother them with butter and real cream. The next morning we slice them and then fry them in butter. The recipe has been handed down to my husband and we look forward to making them for the first time this year. My Swedish grandmother taught my mother to make dumplings. My father said the first ones she made were not a culinary success. The main difference in my recipe is in the filling. I use minced salt pork for the filling and do not use bacon or the onion. Of course we use plenty of butter to clog up our arteries and always accompany the meal with milk. I forgot to mention that I use 2-3 Tbs of the minced salt pork per dumpling. In my opinion using the ground salt pork is an important change in the recipe. Jan 2002. The night before, dice salt pork and onion, mix with a couple of tablespoons allspice, and a bit of salt. Chill. Peel potatoes then grate them onto a cookie sheet using the finest side of the grater (watch your knuckles!). As the mash accumulates, remove it to a wire mesh colander (placed in a large bowl). This process removes much of the water and starch from the potatoes, and the dumplings have a firm, but soft texture. Press mash thru colander like a sieve, removing most of the liquid (a handful at a time). Place in large bowl. Slowly add the flour, mixing well with hands, until you have a soft dough (should hold a reservoir made with your thumb, without collapsing, but not feel dry). Using a tennis ball size handful of the potato mash, form into a ball, and place a lg tbsp of the salt pork mixture in center. 'Patty cake' between your hands to seal seams and balance the center. Place into the small kettle of boiling water for about 5 minutes to set, then transfer gently to large kettle. Once all dumplings are in the large kettle of water, boil for 1 hour, occasionally gently stir with a wooden spoon (be careful not to break them open). Remove and chill. Cut each dumpling in half and fry in butter on both sides til goldenbrown. Smother with butter before serving with a glass of ice-cold milk. It doesn't get better!! Thanks for sharing! Mix flour, salt and sugar, add in some milk. Stir it until it is smooth. Add the rest of the milk and the eggs and stir it all together. Fry the butter and pour the mix in the frying pan. Fry on low temperature (2 on a 6 scale). Stick it carefully with a fork so that it solidifies even. Turn the cake (after 15-20 min., when it’s solid) and fry the other side for a couple of minutes. Mix the breadcrumbs and spices with water and let it swell for a while. Stir the ground meat together with the breadcrumb-mix. Chop finely the leek and put it in the mix. Roll the mix into small balls (1") and fry them in butter. Mix the ingredients for the sauce and pour it over the meatballs. Let it simmer 5-7 minutes. Serve with Rice. Peel and remove pips from the apples, slice them in smaller pieces. Boil them until they are soft in 1/5 cup water and 2 tablespoons sugar. Mix cottage cheese, hulled oats, sugar and cinnamon. Put apples and the cottage cheese mix in layers in a greased, ovenproofed dish. Bake it in 440 deg. F about 15 minutes. Whip the cream with the vanilla sugar and serve it at once. Each these foods has been carefully perfected in the Hitech kitchens of Richard Ohlsson. I believe Richard has worked for years under a stage name on a well known television program. Prior to that he studied under the Team Husqvarna head chef. 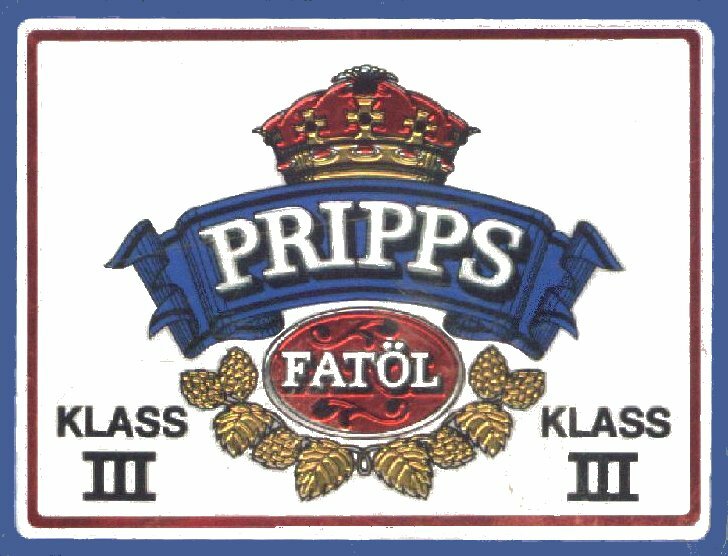 Pripps Blå, Falcon, Spättekaka from Skåne ........I need help! I need Swedish beer and wine labels to display as well as other Swedish culture items. I need additional, authentic Swedish food recipes.